Customer: Chu Yan Industry&Trade Co., Ltd. Address: Whitewater Pa village, Gaoleshan town, Xianfeng county, Enshi state, Hubei province, China. 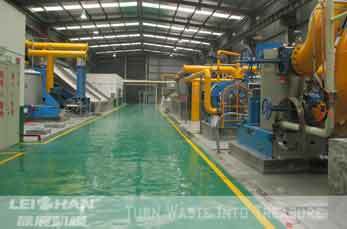 On the early of march, 2015, the new 300T/D White Board Paper, Fluting&Kraft Paper Manufacturing Project have successfully commissioning at Chu Yan Industry&Trade Co., Ltd., Leizhan supplied paper machinery for the customer contains: chain conveyor, drum pulper, high density cleaner, single effect fiber separator, inclined screen, low density cleaner, mid consistency pressure screen, reject separator, vibrating screen, inflow pressure screen, etc. for the customer. Information about Chu Yan Industry&Trade Co., Ltd.
Chu Yan Industry&Trade Co., Ltd. designs, manufactures, markets, and distributes a wide variety of fiber-based products including White Board Paper, Fluting and Kraft Paper. Leizhan delivers innovative paper making solutions and paper making machinery for the kraft paper making line, corrugated paper production line, tissue paper production line, cultural paper manufacturing line and coated board paper making line for paper plants.